Bass are abundant in the waters of North America, which makes them a popular game fish. Even though the waters are heavily populated with bass, that doesn’t mean you will always hook one. 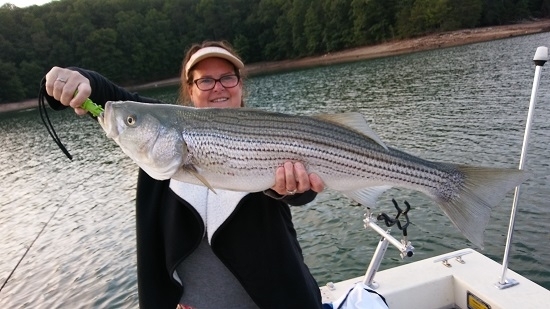 Whether you are angling for largemouth bass, striped bass, or smallmouth bass, these fish can exhibit similar behaviors. Hungry bass are attracted to certain baits on the surface or in the depths. Be prepared at the tackle store and find out which one will work for you! For some universal bait selection tips, consider these four things when choosing the right bait. Bass can be attracted to disturbance on the surface or first layer of water. Stick baits mimic this movement on the water’s surface and more experienced anglers can learn tricks like “walk the dog”. This technique is accomplished by twitching the rod to move the stick bait to go across the surface. Another bait that can be used on the surface or top layer of water are top water poppers. Poppers, also known as chuggers, bait bass by creating a ripple effect or splashing, which mimics a frog's or minnow's movement. Poppers are commonly used in grasses or shore lines, but like stick baits, these can also be used in open water. Crankbait is also a popular bait to use when mimicking the movement of a bass’ prey. Spoons and grub are great for lethargic bottom-feeding bass. Curly tailed grubs is hypnotic to slow-moving bass in colder, open waters. Grubs are not limited to cold waters; you can have great success in warm, shallow waters. Spoons attract bass in deeper waters or bass that are swimming down. Unlike grubs, spoons can more easily glide through weeds, since they are usually made of metal. Crankbaits are also great for maneuvering through weeds or other solid objects like rocks. Crankbaits are a versatile bait, since they can cover lots of water at a variety of depths. Identifying where you are going to try to hook a bass will help you narrow down the right bait for you. Mimicking prey is a truth when choosing bait for any fish, so evaluating where you will be fishing is essential. Top water is going to call for bait that emulates different behavior, so keep this in mind when planning your next voyage!